That photo' gives a great shot of Jezreels Tower in the background.In 1938/39, they had a big army exhibition in the Park with anti aircraft guns, searchlights, sound systems, etc. which, to an 8/9 year old was most interesting. I vaguely remember that on Sunday evenings in the Summer (we had them then! 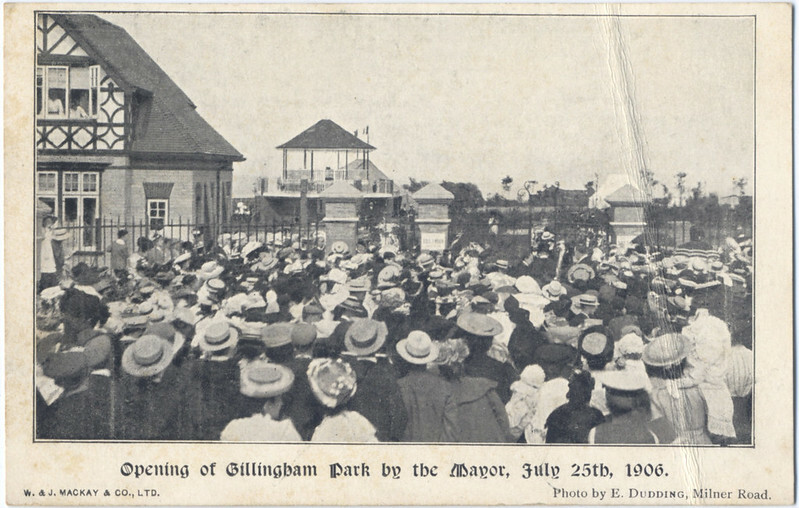 ), we would walk up to the Park to listen to a band playing in the bandstand to a good crowd - I think sitting in deck chairs which were stowed under the bandstand. This is one of those places I've passed by many times, but never visited. 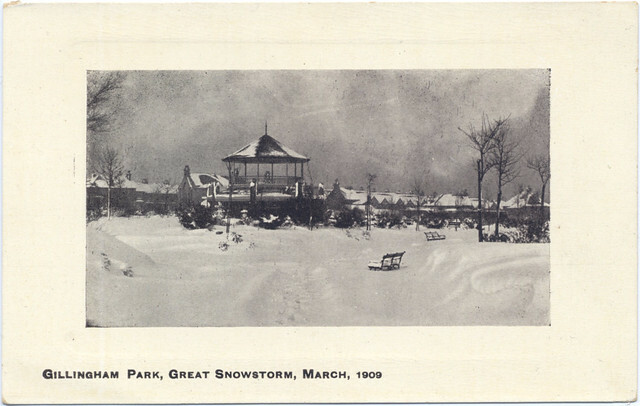 Shame about the bandstand, there aren't that many left now and those that are seem seldom used. Smiffy, a plaque at the entrance by the toilets says it was demolished in the 1950s due to vandalism. 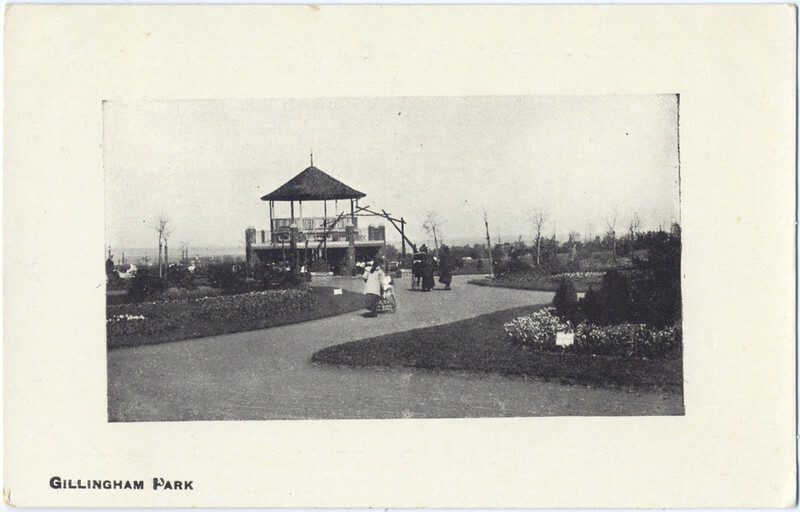 The bandstand looks to have been a bit of a centerpiece but seems to have been removed sometime after the last war. Unable to decipher the postmark on this one. During the late sixties I dated the younger daughter of the Park Superintendent, or park keeper, I'm not sure of his exact title and will not reveal his or his daughters name as it is possible she is still living as she was younger than I. Inside the lodge or gatehouse the décor was quite ostentatious for a young impressionable man of little means such as I, but this is probably where I should get back to writing my story elsewhere on this forum. Not sure when this would date from, probably around 1910. In about 1940/41 the main part of the park was turned into allotments as part of the "Dig for Victory" campaign. A pair of the parks entrance gates are now at Fort Amhersts main entrance. 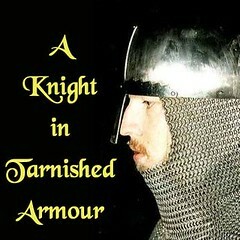 They were donated by Gillingham Council in the early 80's. The gates were restored at the R.S.M.E. at Brompton Barracks. Before the war there were three cannons, one large and two small, probably dating from WW1, by the flagpole which was located below the steps leading down from the bandstand circle into the main park open space. They must have gone for scrap metal in 1939 or '40, as did the railings around the park plus the metal gates. Householders' garden railings also went the same way. The WW1 tank which stood in Rochester Castle grounds near the main entrance suffered the same fate. I wonder if a photo exists of the guns ? Picture removed from post by Moderator. Does anyone remember the little kiosk that was sited near that gate close to the Municipal Buildings? It sold things like ice cream and soft drinks, it was gone by the late 70's. Not sure if it was demolished or burnt down but would love to hear from others who remember it also.